Boxfish’s peculiar shape immediately draws attention to the aquarium. 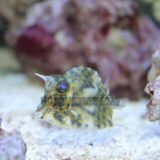 Boxfish’s slow locomotion and bovine-like face makes them a cute and entertaining addition to any aquarium. The scrawled cowfish is our most desired boxfish. I was shocked to get a follow up message on FB asking how my new mantis was doing… and a email AFTER the sale. Awesome service! She is doing well, very active and inquisitive with her new surroundings. Thank you!